Working in Murcia (Spain) recently I have passed a school several times that appears to be covered in something resembling 'artificial grass'. When I say covered - I mean the entire building is covered as the photographs show. It is the strangest thing I think I have ever seen on the external elevation of a building! I don't know the architect or reason behind the design. It's one of those things that I keep meaning to find out. I guess that there is a really good design reason for it... it's just that I cannot think of it! We've been really pleased to be working with Dulux and a number of schools as part of their Smarter Spaces campaign, to help improve learning spaces. It is always encouraging when large commercial companies dedicate time and considerable resources to helping improve learning environments for young people... We at the-learning-crowd are delighted to have been asked to be involved as much as we have been. Critical to the success of the scheme has been the number of schools that they have worked with to get their opinions and advice. That's a really good approach too take, and quite refreshing. We wish that some other organisations thought about asking the pupils first. Hopefully there will be more coming out from this campaign soon. It's always interesting to see any quirky or unique spaces in schools. Touring a school opened in 2013 this week, I was really pleased to see a range of interesting spaces including this rather quirky reading space accessed from the open circulation and dining space. It's spaces like this that attract interest and are extensively used by students. Admittedly this school was built during the BSF (Building Schools of the Future) programme where budgets were more generous, but it is sad that budgets and designs now are so restricted that many schools are now, frankly boring providing nothing more than basic functional teaching spaces. It's location in an open space accessed extensively by staff ad students means that safeguarding is simply not an issue. 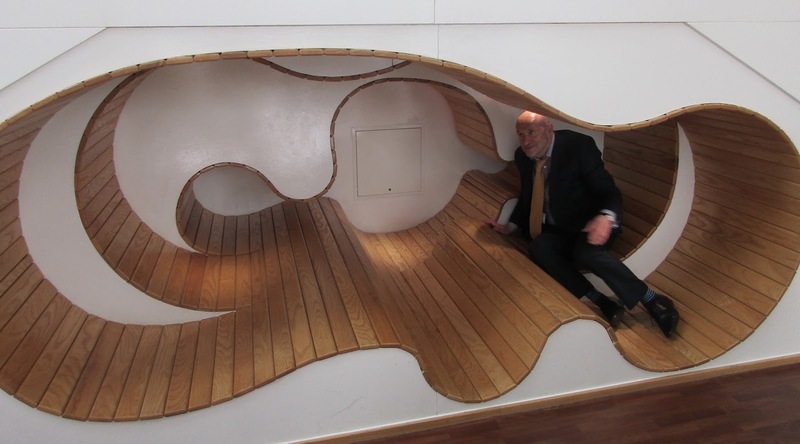 This reading alcove is fab and attracted the interest of lots of people visiting the school. Shouldn't all schools have some space that is unique and attracts interest and excitement. This was a high quality space - pity these are seen less and less these days! It's one years ago that I met Alison Watson in San Diego, along with her group of 11/12 year old students presenting to 700 schools architects about their work in designing school building, including their work in BIM. This was before many architects and even learnt to use it themselves. Needless to say they won a well deserved standing ovation. 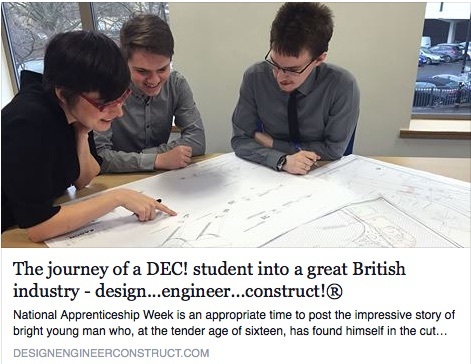 Since then Alison has single handedly battled to gain recognition for her own curriculum which has now become the highly regarded 'Design Engineer Construct' and recognised internationally. It therefore is really heartening to read a fabulous personal account following the journey of one student who took this aspirational curriculum and their successful journey from school to work. If anyone deserves success it is Alison - who is now regarded as the UK's leading spokeswoman on this subject. We are very proud that she is is a Senior Associate of the-learning-crowd. I was taken with this school image recently: the Hallway of Light, from the Church of the Good Shepard / Episcopal Day school in Augusta, USA. It certainly is very dramatic, atmospheric and sculptural - it has presence, it establishes a mood... but I just had to wonder, how realistic is it in a high school with multiple hundreds of students moving around. The opportunities for passive supervision seem to be hindered and frankly it is potentially dangerous. I am certain that it could not pass inspection in the UK with it's strict daylighting / safeguarding requirements. Who knows what could be happening down at the far end? A colleague suggested that maybe it was a staff only area. Whilst I don't know, I am sure that this is not the case but if so, how can some much design be put into a school in an area that students don't access - who is the building for?. Dramatic - but frankly not a suitable design response for a school I suggest! Under stair spaces - use them! It is always amazing how often I visit brand new schools where the area underneath stair cases is not considered. They are rarely used well and most frequently become a wasted space where junk gets thrown. There seem to be three normal strategies. a) Pretend that they are not there and just leave them as a totally unusual space where mischief can often happen. These areas are usually out of sight and a magnet for potential misbehaviour. In the worst case there are low barriers of what look like scaffolding poles to keep people out. All this does is create a very silly, ugly and wasted area. 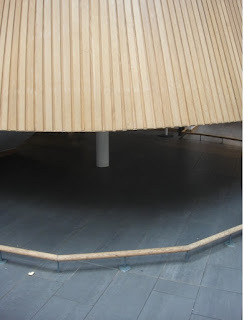 In the photograph below from a school with a very sculptural wooden stair case in the middle of a large commons area, there is real wasted space underneath, guarded by a low rail. 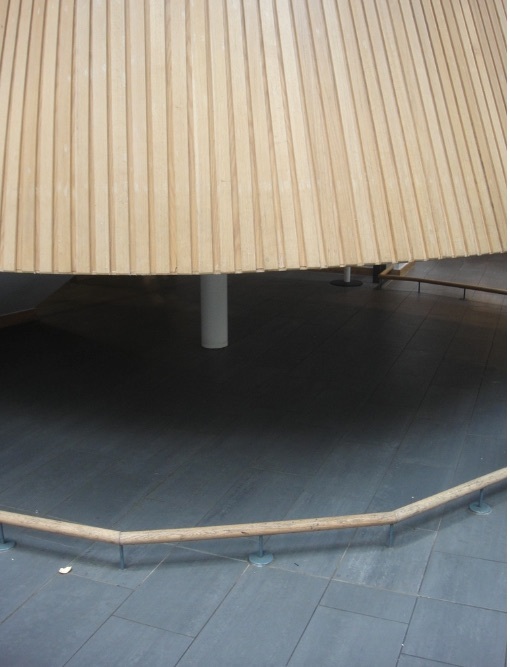 c) Thirdly, and most usefully, put the stairs where they can be seen and passively supervised - and then use the space for learning - creating a small area for quiet social space, learning intervention or small group work. With carefully designed stairs, and considering all the H&S issues, these spaces have the potential to enhance the school environment. It's a pity that more schools do not think about the potential benefits of these areas from the very beginning. It may appear obvious, but as cities get more crowded an increasing number of schools are looking to either expand existing schools upwards or build new schools that have more floors, especially for secondary schools. In reality the youngest students do need to be able to immediately access the outdoors, and whilst the ground floor is the usual solution, there is no difference if they have access to large learning balconies or terraces. There is no reason why not. However, there is no reason why secondary schools cannot 'go high'. 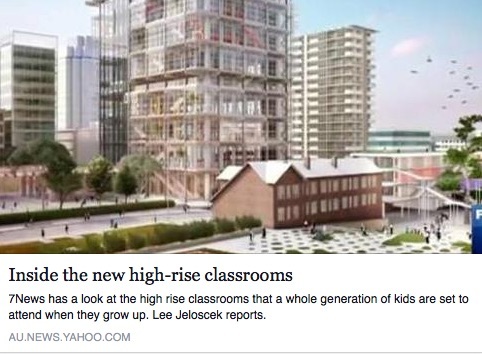 There are now schools in the UK adopting high buildings. I, with other members of the-learning-crowd have been involved with a number of them. These include the King Solomon International Business School in Birmingham which has taken over an eight storey high building. It makes sense and provides the ability to create a number of zones and dedicated floors in an extremely crowded urban context. The chances of building a spread out school on two or three floors in this area are non existent. The resulting facility, once completed, should be amazing. It is interesting to see the new concept for the new high rise school in Parramatta, Australia which is deliberately designing such a new building. It makes sense and looks like a really exciting concept. For the sake of equity this interview includes someone objecting to it as not suiting all students. I would suggest that no building, no matter how low or high, suits every student. The priority survey is to provide the best possible specialist innovative solutions in crowded cities so all students, staff and the wider school community can thrive and get excited about their education.